Behavioral health refers to both mental health and substance use, encompassing a continuum of prevention, intervention, treatment and recovery support services. It is the promotion of well-being by preventing or intervening in mental illness, excessive substance use and substance use disorders. The Violence and Injury Prevention ‒ Mental Health Promotion (VIP-MHP) Branch prioritizes behavioral health along with healthy social norms, economic stability and supports and connectedness, to build community resilience and prevent multiple forms of violence and injury. Weak educational, economic, and social policies/laws. Density of outlets that sell alcohol or marijuana. Access to mental health and substance abuse services. Witnessing violence and/or history of violent victimization. Community or social norms that encourage substance use and/or discourage seeking help. By working toward behavioral health as a shared priority, the following programs leverage resources to address upstream risk and protective factors, and prevent multiple forms of violence and injury at once. 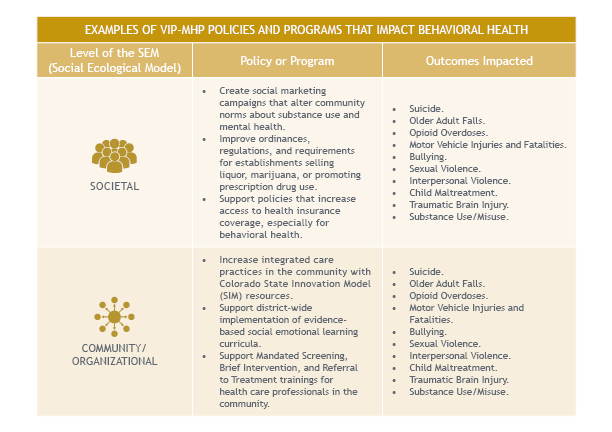 While the VIP-MHP Branch primarily works at the societal and community/organizational levels, the branch also collaborates with partners working at the individual and interpersonal levels of the model. Retail Marijuana Education and Prevention. Excessive Alcohol Use Epidemiology and Prevention.